Nebraska’s wind capacity is fourth-best in the country when it comes to the potential for producing electricity, but the state lags behind 16 others when it comes to actually tapping that resource. That could soon change, though, as more high-profile wind developments come blowing through — one, the 400-megawatt Grande Prairie project in Holt County, already is helping Nebraska catch up to its potential, industry watchers say. Continue reading. Photo Credit: Megan Farmer / The World-Herald. 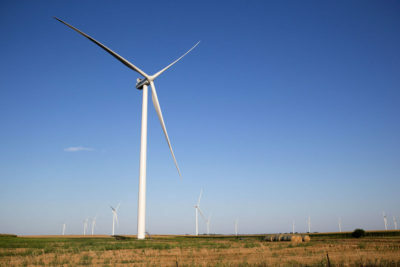 Turbines at Grande Prairie, Nebraska’s largest wind energy development, helped push wind’s share of electricity generated in Nebraska to more than 10 percent. This entry was posted in Nebraska / Midwest News, NewsBlog and tagged Cole Epley, Omaha World Herald, wind energy development in Nebraska on April 26, 2017 by Helen Deffenbacher.